Nacho Patrol has found that when you want to start a spirited debate among a group of Bostonians, don’t bring up up politics, abortion or sports teams; just let it be known that you run a nacho blog and that Sunset is ranked #3. Little inspires such shock and affront as a bold dismissal of what is colloquially thought of as the best nacho destination in town. Now, we are nothing if not cocky about our superior nachowledge, and we generally do our best to spread The Gospel Of The Pour House amongst the plebians. But the constant criticism has gotten us a little down of late, and a kernel of doubt is growing: could we have been wrong? In the interest of a little follow-up to one of our seminal reviews (and indulging in some admittedly top-tier nachos), we returned once more to Sunset Grill & Tap, with an open mind and some new reviewers in tow. On this trip, we learned from our previous experience and made two changes to our order: we elected for the chicken chili in lieu of barbecued pork, and made sure that the salsa and sour cream were on the side. Quality of Ingredients: (Originally: 9) While we had hoped to steer clear of flavor cohesion problems with the chicken chili, it was disappointingly bland and sweet. Other than that, the rest of the ingredients were top-notch. The guacamole was excellent, and we barely bothered with the salsa due to all of the flavor already in the plate. The chips seemed less cardiovascularly damaging this time, which was welcome. However, either due to their structural integrity or the way they were handled during the composition, a significant number of chips were broken in the bottom of the nachos, in small enough pieces to render them rather unusable as topping-delivery vehicles. This, combined with the lame chili, constitutes for us fundamental design flaw, and we are once again going to knock off a point. ( 8 ). 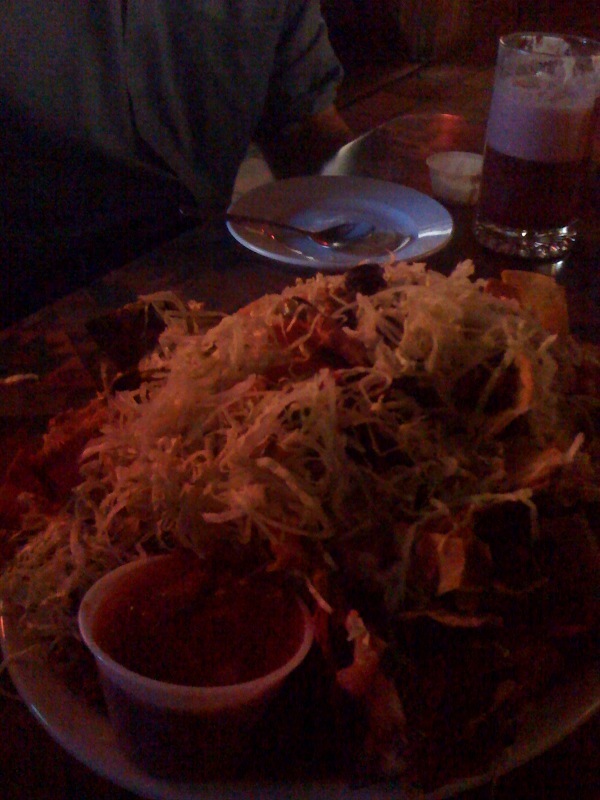 Distribution of Toppings: (Originally: 7) Nearly every review of these nachos, written or oral, formal or anecdotal, mentions the encasement of the topping of choice within a near-impenetrable fortress of chips and melted cheese. We had a large quibble with this last time, but on these nachos it was not so pronounced. Perhaps the more viscous chili was easier to extract; perhaps the chef was feeling frisky that evening. Whatever the case, our previous difficulties with the hidden topping seemed like nothing more than a bad dream… plus two! (9). Price: (Original: 10). Maybe raised up to $13? Still, hard to beat (10). Overall: Still 35/40. We thought long and hard about these nachos, their strengths and weaknesses, how they had changed and how they had remained the same. Yet in the end, we came to the same conclusion: an excellent nacho, good enough for podium-placement. Now, if only we had spent this much brain power on our SAT’s…. I’d be the first to start that debate about Sunset Grill & Tap. I agree with the lettuce nuisance though.